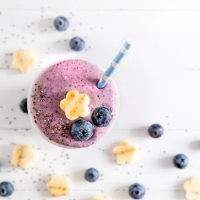 Combine frozen Wild Blueberries, banana, almond milk, vinegar, and protein powder (if using) in a blender. 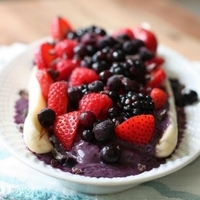 Pat dry additional two tablespoons of frozen Wild Blueberries, and roll in cane sugar if using. 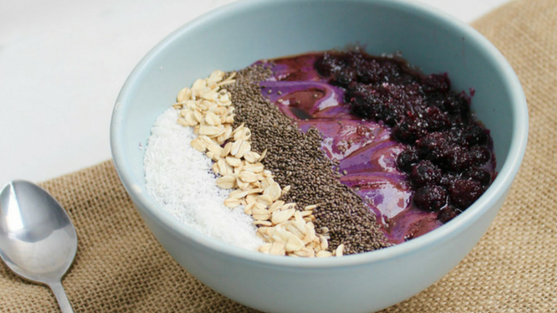 Pour smoothie into a bowl, and top with chia seeds, oats, coconut, and additional frozen Wild Blueberries. Drizzle with additional balsamic vinegar if desired.